Chicken Breasts Savoyard, Artichoke Bottoms, Thyme for Cooking main course. An elegant party dish, it expands easily. 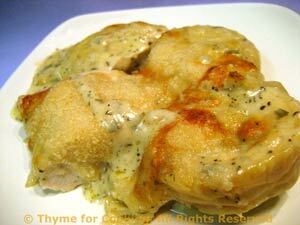 Boneless chicken and artichoke bottoms, baked in a white wine sauce. It can be prepared ahead and baked at the last minutes. Very little work for gourmet main course. Serve with some fluffy Basmati or Mashed Potatoes. Cut onion in half and slice thinly. Cut the chicken breasts in half, the short way. In nonstick skillet heat oil over medium-high heat. Add onion and sauté until tender. Add tarragon, thyme and chicken breasts and sauté until chicken starts to brown. Add the white wine, cover and reduce heat to low. Simmer for 10 minutes. Open and drain artichoke bottoms. In a small baking dish (just large enough to hold everything and, if possible, nice enough to go directly to the table) arrange artichoke bottoms in a single layer. Remove chicken breasts and arrange around artichokes. Increase heat under skillet to medium-high, add the chicken broth and mustard to the wine. When simmering hard stir in cornstarch mixture and cook until thickened. Remove from heat; add yogurt and Parmesan. Pour sauce over chicken and artichokes and bake in 400F (200C) for 15 minutes.